Springfield, MO — Carnahan, Evans, Cantwell & Brown, P.C. (“CECB”) is pleased to announce that Andy Peebles was recently selected to participate in Leadership Springfield Class 36. Leadership Springfield is a nine-month comprehensive community-based leadership program. Mr. Peebles is a member of the Estate Planning group at CECB and his practice involves interpersonal communication with clients aimed at understanding their unique estate planning needs and objectives, and the preparation of various estate planning documents, including simple and complex trusts, wills, powers of attorney, premarital agreements, and business documents to accurately reflect those needs. Mr. Peebles also assists clients in the administration and distribution of the estates and trusts of recently deceased loved ones. 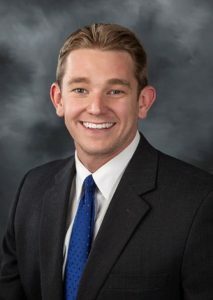 Mr. Peebles earned his Juris Doctor from the University of Missouri School of Law, graduating with a concentration in Estate Planning and Taxation.